I love plums and since they are now in season locally, this is the best time to buy them as local always has the best flavour. Generally, they are allowed to ripen properly. I couldn’t resist buying a bunch at a local farm stand, But I could only eat so many so I decided making plum sauce while they were at their peak was just the thing to do. 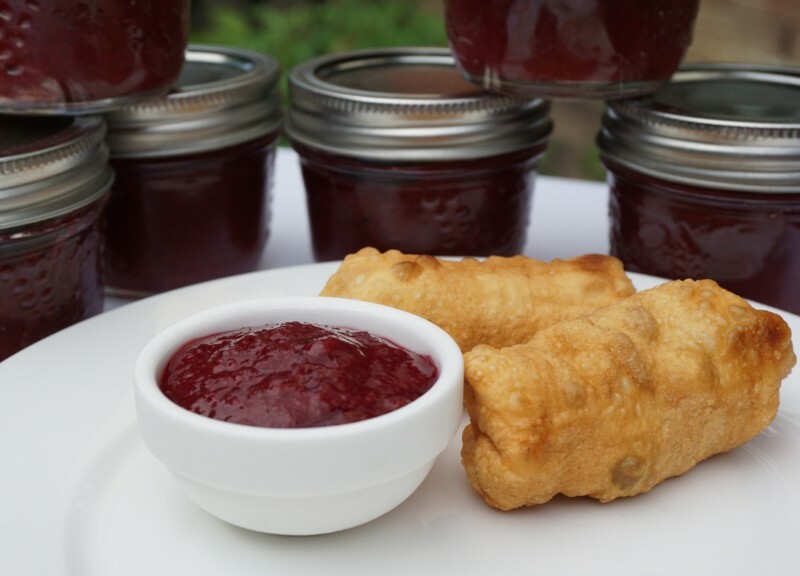 Plum sauce is traditionally served with egg rolls or savory dishes although this one is good on toast as well. And is quite easy to make. As a gut-friendly recipe, it has both prebiotic power to feed residential bacteria and probiotics to help the gut function better. Onion, garlic and ginger are all prebiotics. Tamari, apple cider vinegar and sauerkraut all contain probiotic bacteria. Raw honey has both. All this plus chili powder as an digestive aid makes this plum sauce a perfect aid to digestion to get the most from your meal or snack. The secret to maximizing the probiotic benefit is to add the honey, sauerkraut, tamari and apple cider vinegar after the plums and the other ingredients have been cooked. It may seem strange to add sauerkraut but it provides a nice balance to the flavour of the sweet plums. Slice plums in half and discard pits – no need to peel them. Cut the pieces into 8 chunks. Place them in a saucepan. Add the onion, garlic, ginger, chili powder and water. Place the saucepan on the stove on medium heat. Bring the mixture to boil and stir as it is coming to a boil. It takes a few minutes for the liquid to come out of the plums and stirring prevents it from sticking or burning. Once it is bubbling, turn down the heat to low and cook for about 25 minutes until it is soft. Use a hand-blender to puree or transfer to a bender and puree until smooth. Add the tamari, honey, apple vinegar and sauerkraut. Puree again. Season with sea salt and pepper to taste. Transfer to a jar with a lid and store in the refrigerator. It will keep for a week. For longer, put in a plastic container and freeze.